Very good friends of mine moved to Nashville for work-related reasons a few months ago. 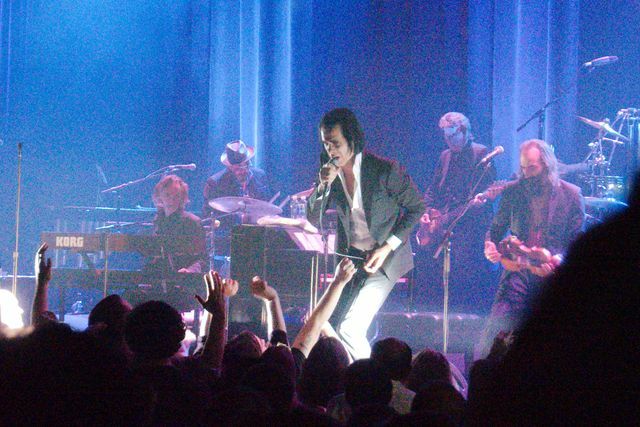 I’d have gotten down there to see them sometime anyway, but when Nick Cave’s 2013 tour was announced, getting tickets for the Nashville show at the historic Ryman Auditorium was inevitable – my friend V and I always see Nick together: in DC, LA, or Tennessee! 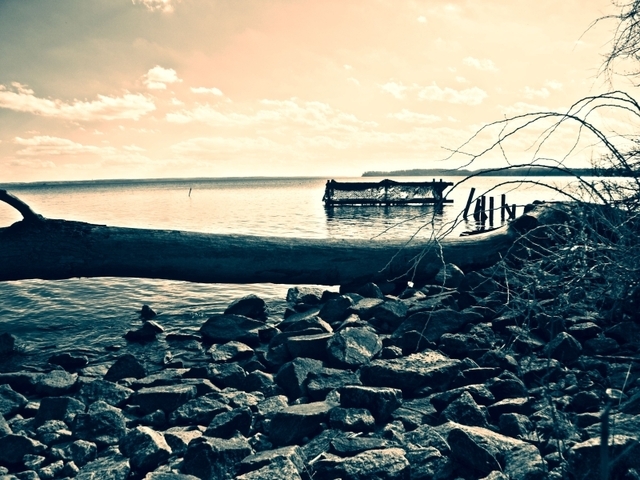 Other than a brief sojourn through the very edge last summer en route to southwestern North Carolina, I’d never been in Tennessee before. I picked my weekend judiciously: Friday and Saturday temperatures were near 80. Heading south in the US is always a bit of a risk for a vegan; I have preconceived notions of endless barbecue pits, bacon-wrapped cheeseburgers, and gallon jars of mayonnaise. I am very pleasantly surprised to be able to tell you that Nashville is actually very vegan-friendly! The food situation was not at all what I imagined. My first impression of Nashville was that it is very tiny. I flew in from Dulles on a tiny little commuter plane and arrived in tiny little Nashville International, where I strolled to my rental car on foot. Other than Charleston, which also has a teensy airport, I’m used to huge, sprawling airports – like Dulles – with shuttles, trains, multiple terminals, and miles upon miles of walking. Every time I visit the South I’m also immediately impressed by how friendly everyone is. People are nice in the South. Up here in the Midatlantic and north, people are BORED OF YOU and not afraid to let you know it. I collected my car and headed to V and C’s house to rouse them from their 9 a.m. slumber. V immediately slipped into hostess mode and we were off to see the sights of Nashville. Which really aren’t that many as it’s a very tiny town. One of the more interesting and unexpected was … the Parthenon?! Yes, that’s right. 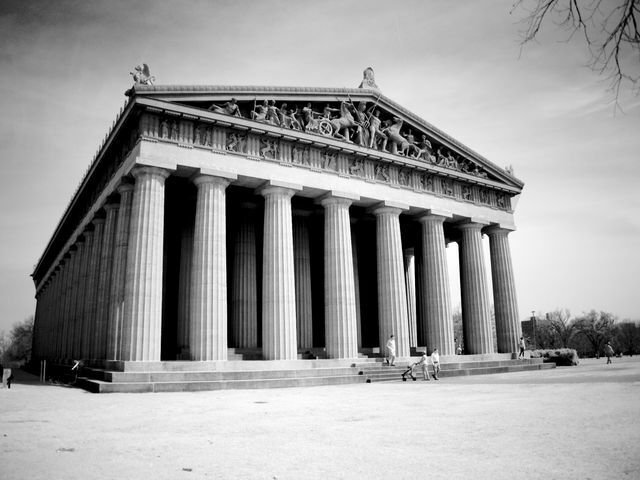 Nashville is home to the world’s only full-scale replica of the Parthenon, which I was told by the attendant is even better than the real Parthenon because it represents the Parthenon in its glory, not ruins. I have to admit, the top floor with its immense statue of Athena – created to look exactly as it would have looked in ancient Greece – was pretty interesting. 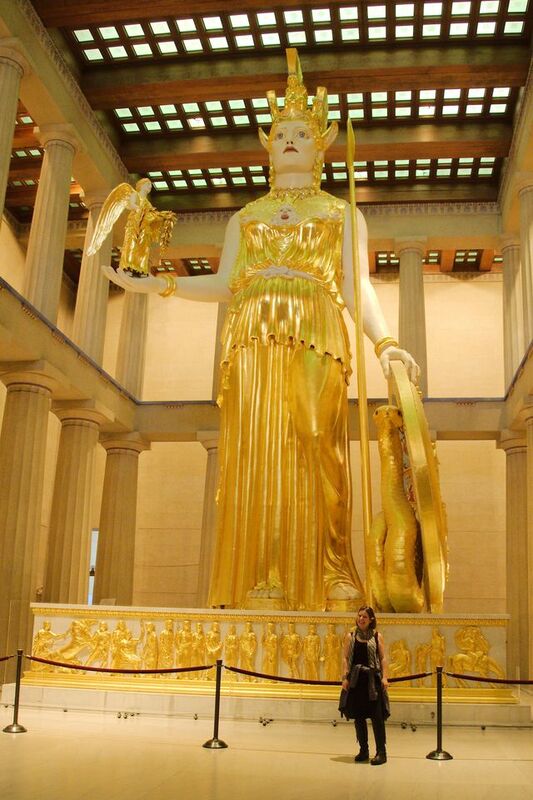 To give you a sense of scale, here is me in front of Athena. 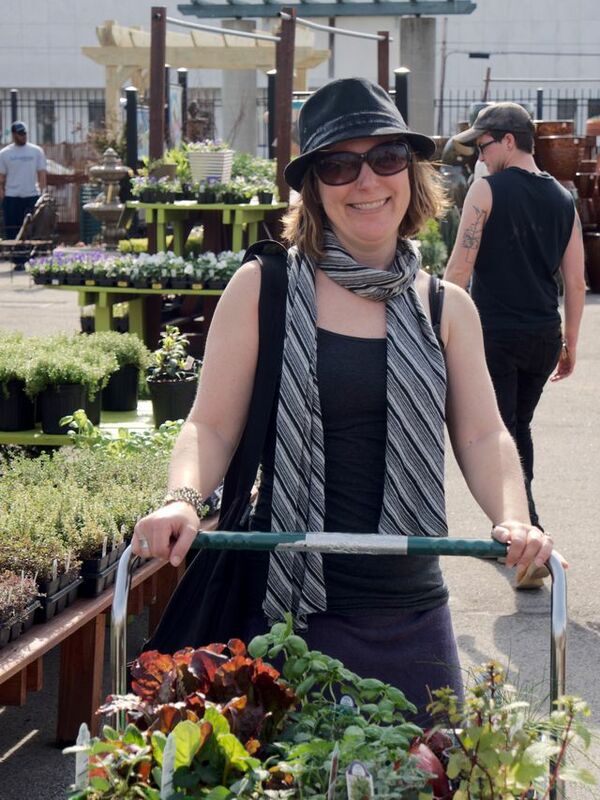 Another fun thing to do was the farmers market. The market comprises a flea market, food court, farmer stalls, and a garden center. V and C bought a bunch of plants to start a garden. And I’m wearing a hat C bought at the flea market. Nashville’s greatest attraction, however, is Didi Mao! 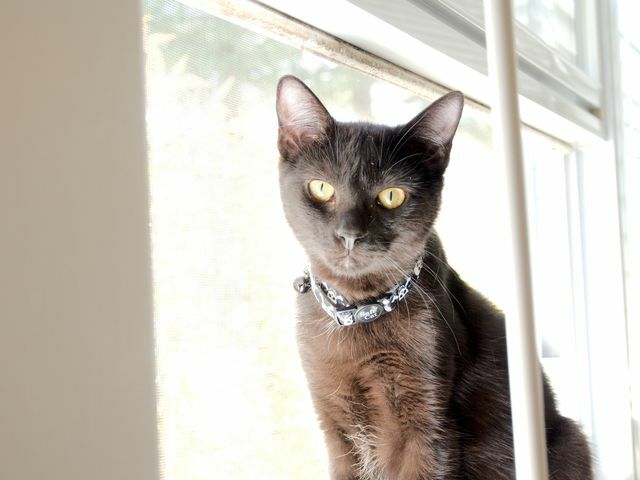 Didi Mao is the 6-month-old kitten belonging to V and C and she’s super, super, super awesome! She looks like Gomez and acts like Torticia. She’s very friendly and playful and we hit it off instantly. LOVE Didi Mao. So, the food. When she first got there, V promised me there was plenty for me to eat, and although I would never accuse her of lying to me (except about bloody marys, boat drinks, Prosecco, hammocks, and guacamole), I wasn’t really expecting to, you know, see the word “vegan” right on menus. BUT IT’S THERE! Nashville knows what vegans are! Nashville seems to HAVE vegans! (Nashville also has really good beer, by the way.) After a long, adventurous day, we decided to settle in Friday night with a box of wine and what V claimed was the “best pizza in the world”. 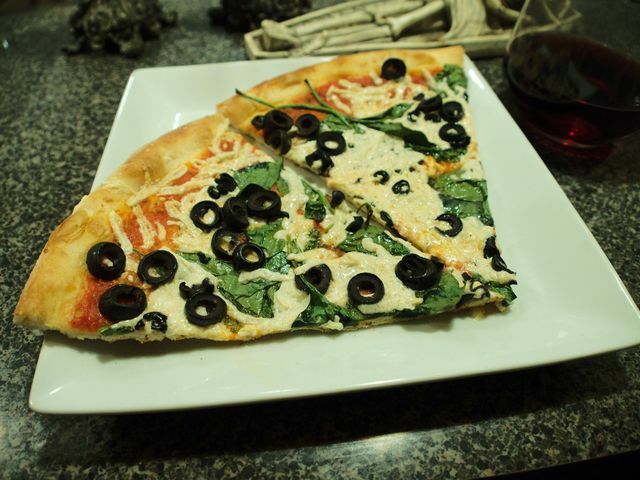 We got carry-out from Five Points Pizza, which not only has a vegan pizza on the menu, but will make any other pizza vegan with Daiya cheese. And V was right, the pizza was GREAT. Definitely one of the best I’ve had, and I love me some pizza. It may have been better than my pizza! 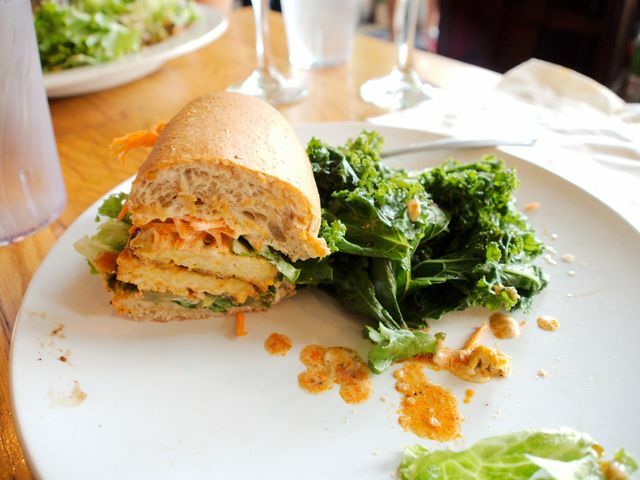 Nashville even has a few completely vegetarian restaurants. The Wild Cow is almost entirely vegan and really great. It’s one of those rare restaurants where I’m actually overwhelmed by the menu because I have too many choices. I ended up getting the Buffalo grinder, which is tempeh or tofu smothered in Buffalo sauce, with shaved carrots, pickles, and vegan ranch. I had a side of garlicky kale, which was perfect. I forgot to take a picture until after I’d eaten half the sandwich. I’m looking forward to returning here the next time I visit V, and I think she is too. Across the street from the Wild Cow is Rosepepper, a Mexican restaurant, which we visited Sunday afternoon before I headed back home. 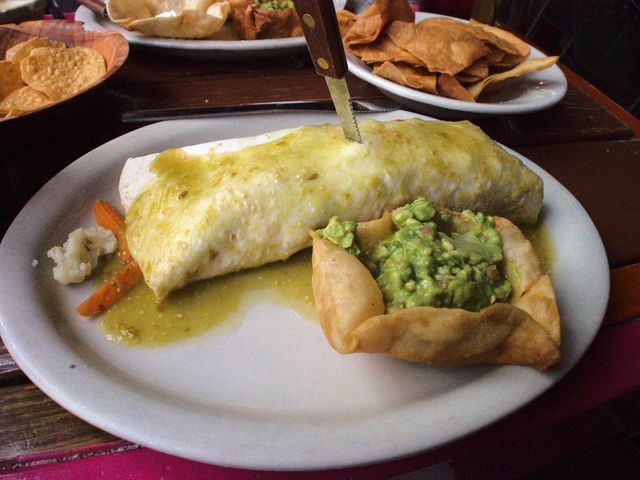 I was pleasantly surprised to see a vegan burrito on the menu and it was HUMONGOUS, but I’m afraid it was also rather bland. It consisted of steamed carrots and cauliflower, a few black beans, and rice, and really could have used some spice. And what about the main attraction – aside from Didi Mao (oh, and that minx V, of course) – of the weekend? 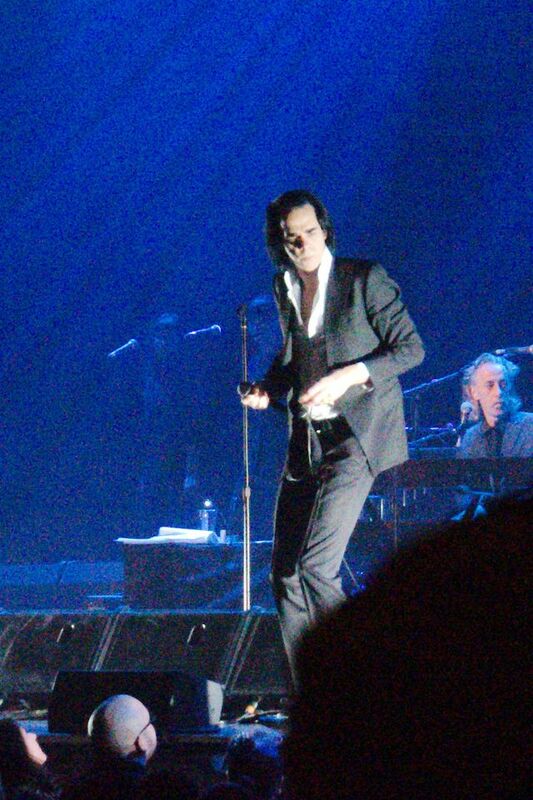 Nick Cave was amazing!! Of course. He always is. I’ve seen a LOT of shows over the years and there are some performers who just have an incredible stage presence and can really rock a live show…and many more who can’t. 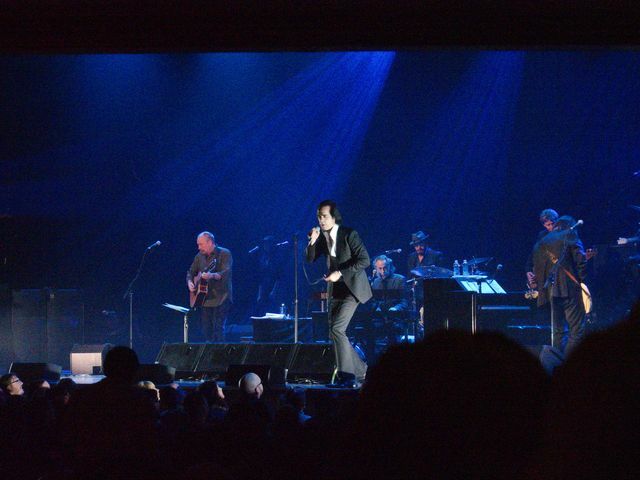 Nick Cave is one of the best live performers I’ve ever seen. And the Bad Seeds are really tight. Nashville isn’t a city I’d have gone out of my way to visit, but you have to like a city that identifies so closely with music, and it’s super-easy to get around (there’s no traffic! ), there’s a lot of beer, and it’s surprisingly vegan-friendly. I’m looking forward to visiting V, C, and Didi Mao again soon, so SOMEONE HAD BETTER GET THAT HAMMOCK HUNG. No food today, sorry. I do, however, have a request, and then some raptor tales and pictures. First, it’s been a while, so here is a raccoon! This is Sophie and she’s super sweet. I don’t think I’ve put a name to the wildlife sanctuary where I volunteer and take all the pictures of raccoons I’m always treating you to or boring you with, depending on your perspective. It’s Dogue Hollow Wildlife Sanctuary and you can also find us on Facebook where we post a lot of pictures. I’ve been occasionally asked by readers how they can give me something to thank me for my recipes or pictures or something I’ve sent them. I don’t want or need anything. I keep this blog because I enjoy doing it and because this is my only contact with the vegan community. Mark and I are able to pay our server costs without a struggle and I’ll never subject you to advertising. But while I don’t need anything, Dogue Hollow does, and although I’d be uncomfortable asking for donations in my capacity as a blogger, in my capacity as a Dogue Hollow board member, I’m kind of obligated to make my first feeble fundraising attempt. 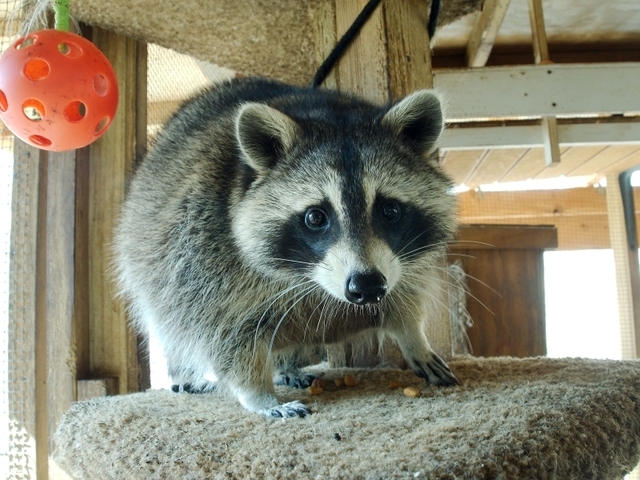 We have two very large projects we desperately need to do as soon as possible at Dogue Hollow: we need to build a new nursery for baby raccoons, which will require about $6,000, and we need to install a generator, which will require about $14,000. 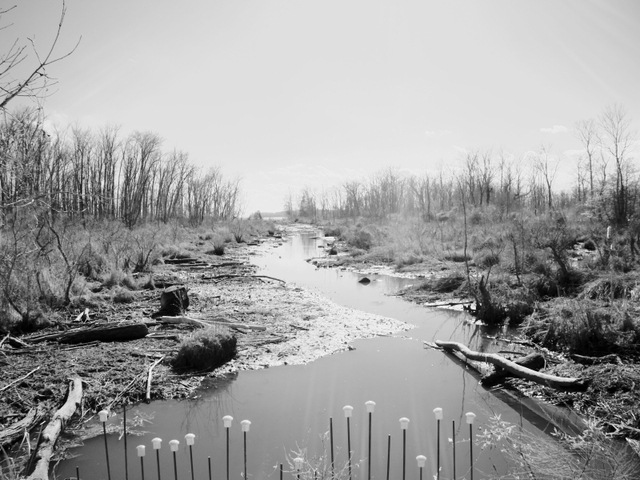 Dogue Hollow was hit hard by the derecho last July: we were without power or water for 5 days in the 100+ degree heat. Had the storm hit a few weeks earlier when the babies were younger, we’d almost have certainly have lost some of them; we were very lucky they all survived, but it was a terrible strain on our resources. It is VERY hard to keep nearly 50 baby animals alive without running water for cleaning or electricity to refrigerate formula and medicine. The weather around here is only getting weirder and we are likely to lose power for multiple days during any bad storm. Hence the need for the generator. Our first priority is the new nursery, which we need because we’ve been taking in more and more baby raccoons every year and we simply no longer have room to house them. If we don’t have more room, we run the risk of having to refuse raccoons simply for lack of space. These needs put our operating costs very much over our normal annual budget, and we usually scrape by as it is. So we’re trying to ramp up fundraising right now…though none of us are fundraising experts. (By the way, if you are and you want to volunteer, let me know! And also if you live in Northern Virginia and want to volunteer in some other capacity, let me know.) We’ve opened a special savings account specifically for these two projects and kicked it off with two very generous donations totaling $3,500. I don’t expect most donations to be anywhere near that large, but they put us more than halfway to getting the new nursery, which means smaller donations of even $10 will go a long way to getting us the rest of the way there. So if you’ve ever wanted to thank me for anything, or if you like my raccoons stories and pictures, or if you just want to help wildlife, please consider making a donation, however small. You can do so either via Paypal on our website or by sending a check. You don’t have to, but if you’d like, you can mention with your donation that Renae sent you – I don’t get anything but gratitude from the other board members, but it helps us to know how people heard about us. This just in! After discussing this with Mark, I can offer anyone who makes a donation of $20 or more a free custom drawing by Mark. Mark is an amazing artist. He could seriously have a second career drawing comics. The only restriction is you must request something “fanciful” that leaves him room for creative interpretation: for example, a raccoon eating a sandwich, not Batman. He’s also very good at aliens, monsters, and the like. 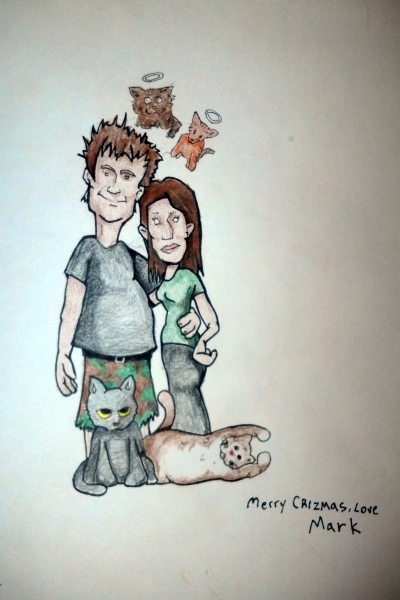 This is a picture he drew for me last Christmas. If you’d like to receive a drawing from Mark, you’ll have to let me know personally as Mark isn’t making this offer to Dogue Hollow in general, so email me at renae@ineluctable.org if you are interested. 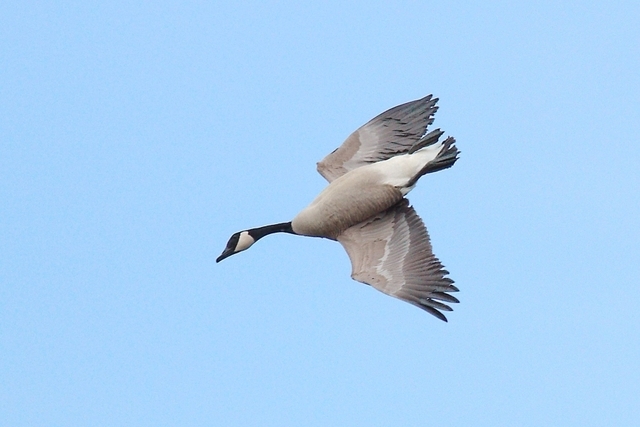 That turned out not to be the only eagle I saw last week. 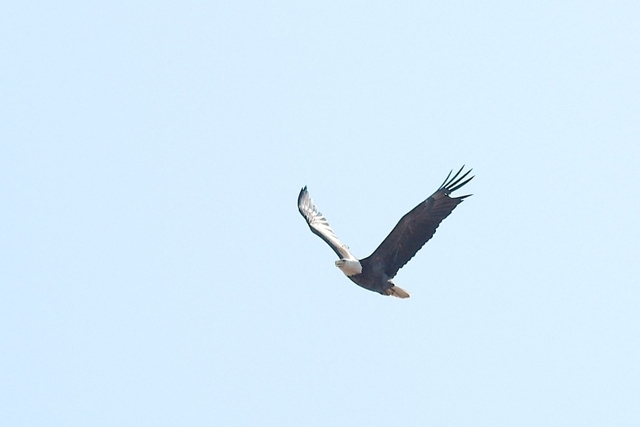 I later saw one standing on the side of a busy parkway, which kind of freaked me out because you just don’t expect to see a bald eagle on the side of the road when you’re whizzing by at 60 mph in crazy suburbia Northern Virginia. So I had mixed feelings about that: I’m always in awe when I see them, but I hate seeing any animal near a road. 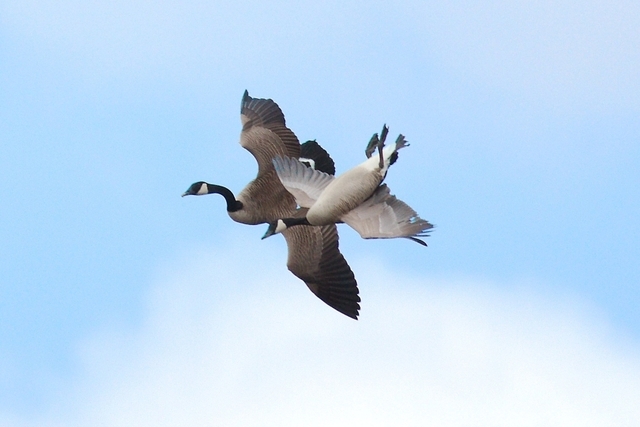 Apparently this maneuver is called whiffling and if is something they will sometimes do if they need to slow themselves down very quickly for a landing. I think it looks very silly! 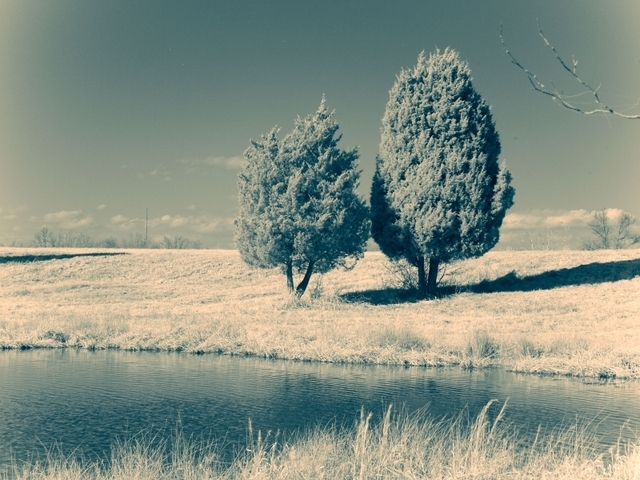 After two parks and an exploratory drive, we’d seen zero hawks and we were freezing. We drove back home and parked in our driveway. 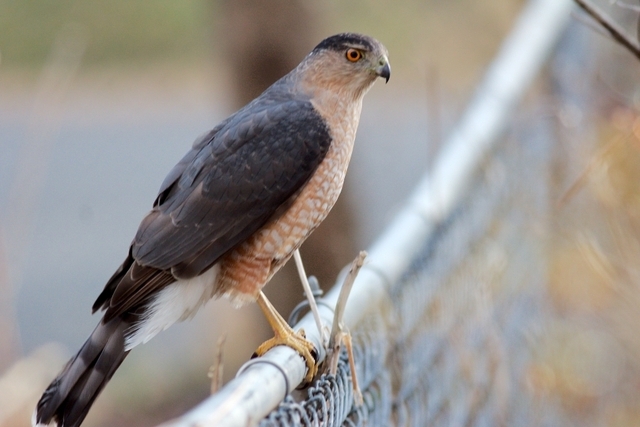 I gathered my cameras and was hopping out of the Jeep when Mark said, “There is a huge bird sitting on the fence!” And there was a Cooper’s hawk, sitting 20 feet from my front door! 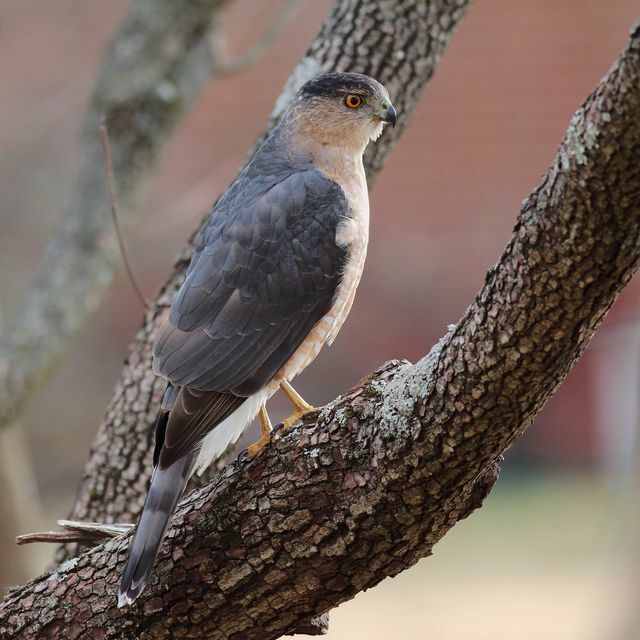 Unfortunately, I have a feeling this hawk was menu planning on my fence – he was 10 feet from my bird feeding station and probably hoping for a snack of songbirds. This kind of upsets me because I want the birds I feed to feel safe. But at the same time, LOOK AT HIM! He’s awesome! That’s it for now. Thank you for indulging me with this post. I promise I’m hardly ever going to make any mention of money for raccoons and I’ll keep posting pictures of them no matter what because people seem to like it. It’s just I’ve been tasked with trying to think of any source possible of animal lovers and it dawned on me that the audience of a vegan blog is probably a good source of animal lovers. Thank you for being really, really great readers whether or not you are able to donate. I have to tell you, I don’t really visit a lot of forums or anything like that because I get really depressed by the negative vibe of many of them, plus I’m very shy – bizarrely even more shy online than in real life – but everyone who comments here, and the writers of all the other vegan blogs I read, are so nice and supportive and wonderful; it restores my often-flagging faith in humanity and truly means a lot to me. I feel like I should be donating to you guys, not the opposite.